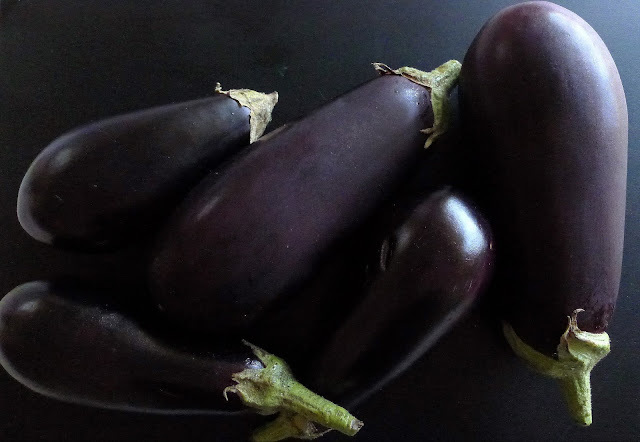 Eggplant (also known as aubergine) may be my favorite summer vegetable. It’s so incredibly versatile—fry it, roast it, stew it, pickle it. 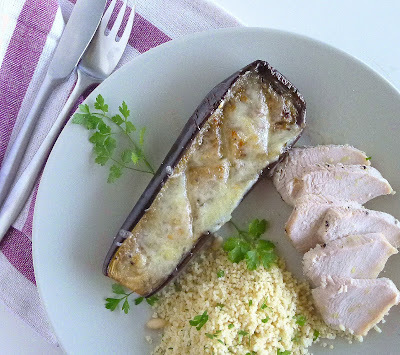 Eggplant pleases me, too, because it has a meaty umami-ness that makes it a good main ingredient for meatless meals. Think eggplant parm or eggplant stuffed with rice and pine nuts. Sometimes I just want an easy side dish to go with roast chicken or grilled meat. 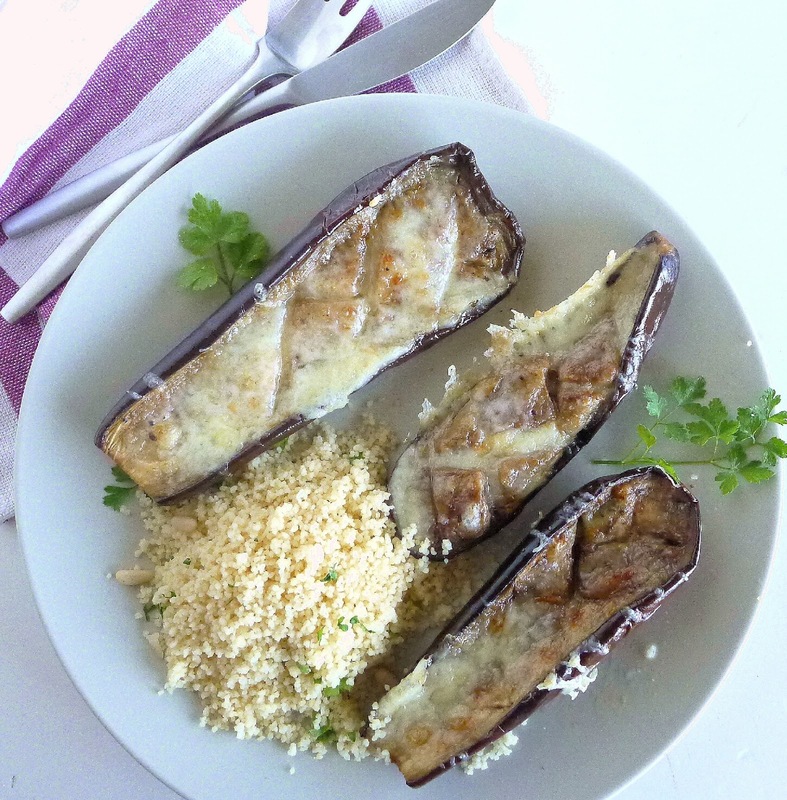 This roasted eggplant with cheese does double-duty—as a side, it bakes alongside a roast and, for another day, becomes the main attraction, accompanied by rice or cous cous, for a vegetarian meal. The blend of spices gives the eggplant a subtle, exotic flavor. Known as Mudéjar style, for the Moors who opted to stay in Spain under Christian dominion after the Reconquest in 1085, the spice blend includes cinnamon, black pepper, ginger, nutmeg and coriander. 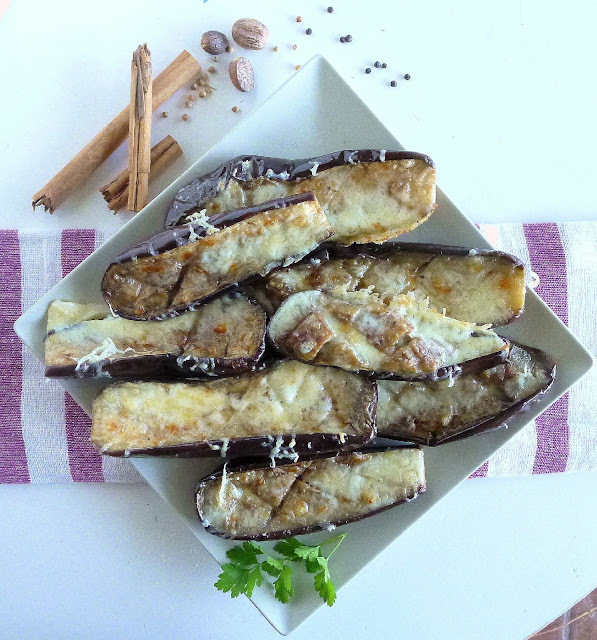 A blend of spices including cinnamon, nutmeg, coriander and pepper seasons the eggplant. 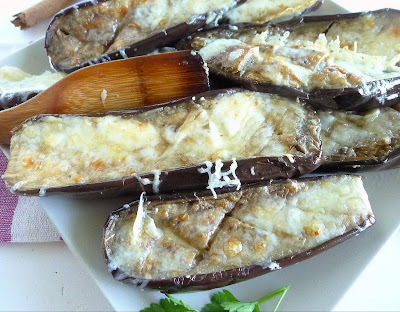 Melted cheese tops the slow-roasted eggplant. --or as the main dish for a vegetarian meal. Don't those look like cutlets? Serve eggplant hot or keep it for another day and serve it room temperature. The spices and wine make candy of the slow-roasted eggplant. 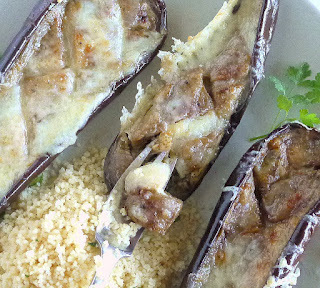 The eggplant skins are like a terrine, with roasting they become tough and are not meant to be eaten. While authentic Manchego cheese (a sheeps’ milk cheese) is best, you could substitute Parmesan, Gruyere, or pecorino. I’m thinking the eggplant would work on a grill, too. Spread the halves with spices and oil and wrap them in foil. Once they are tender, unwrap and cover with cheese. Let it melt on the grill. Serves 6 to 8 as a side; 3 or 4 as a main. Cut off and discard stems and leaves. Cut eggplant in half lengthwise. With a sharp knife, make deep cuts in the flesh lengthwise and crosswise. Salt the eggplant and leave them, cut side down, to drain for 1 hour. 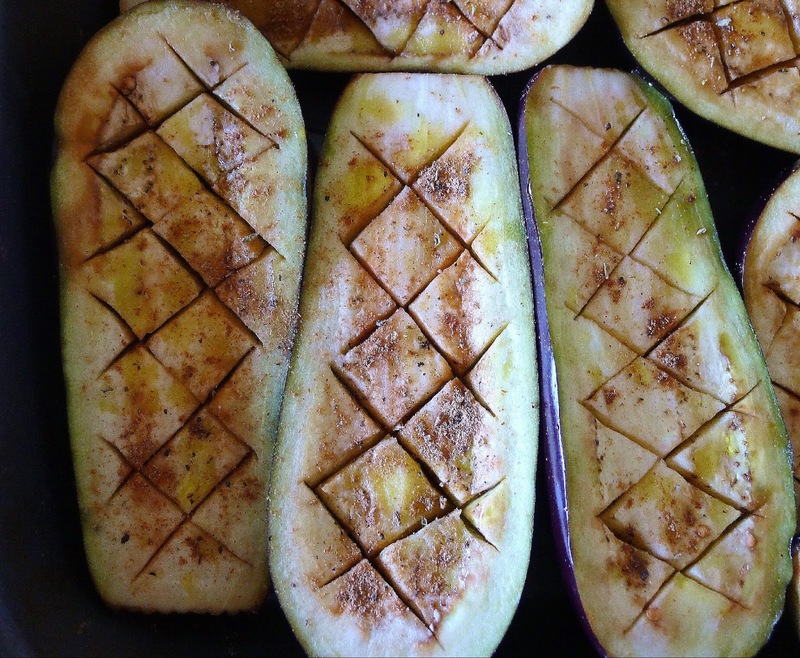 Score eggplant and sprinkle with spices. Rinse the eggplant in water, drain well and pat dry with paper towel. Place the eggplant halves, cut side up, in a single layer in a baking pan. Drizzle with the olive oil. Combine the cinnamon, cloves, ginger, coriander, nutmeg, oregano, and pepper. Sprinkle the spices over the eggplant. Bake 15 minutes. Pour the wine over the eggplant. Return to oven for 15 minutes. 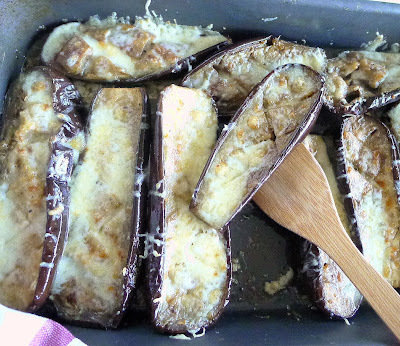 Turn the eggplant cut-side down and bake 30 minutes longer, or until they are fork tender. Spread grated cheese on top, return to the oven to brown. Turn cut side up again and spoon pan juices over the eggplant. (If pan is dry, add about ¼ cup of water.) 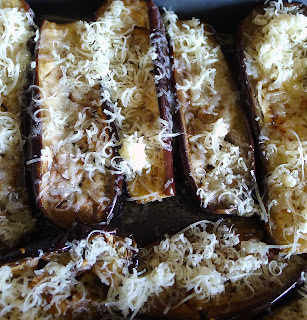 Spread the grated cheese on top of the eggplant halves. Return to oven and bake until cheese is melted and lightly browned, 12-15 minutes. Serve hot or room temperature. Fried Eggplant and Cheese Stacks. 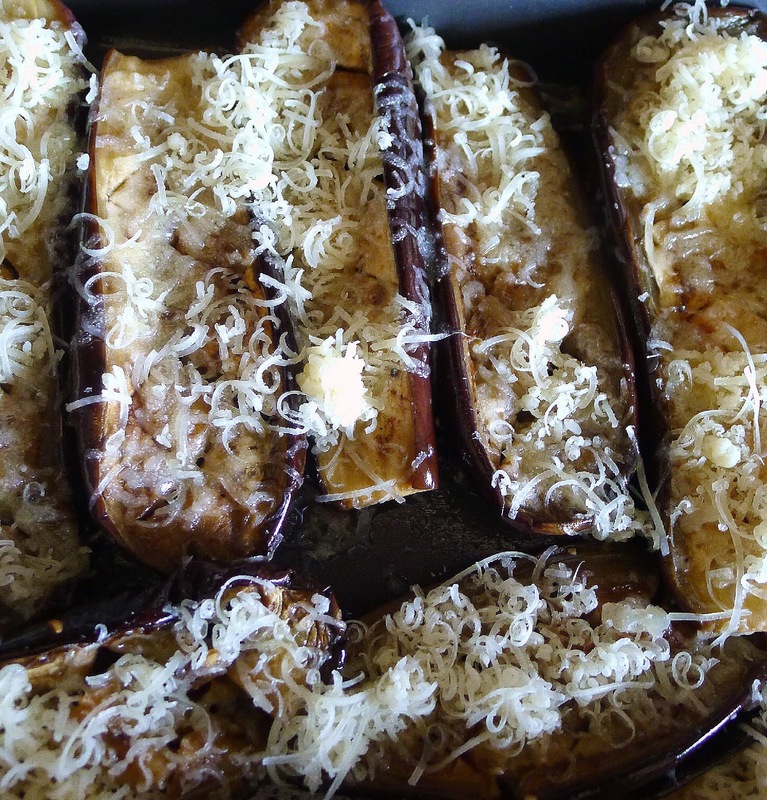 Thank you for these recipes we are poised for the annual deluge of eggplant from our garden and normally we run out of ideas of how to use them long before we run out of eggplant. It's good to know that you can freeze the cooked eggplant after scorching and removing the skin if it is intended for Baba ganoush, it emerges looking a bit grim but when mixed with the other ingredients, is just like freshly made. Jane: Lucky you, with an eggplant deluge. 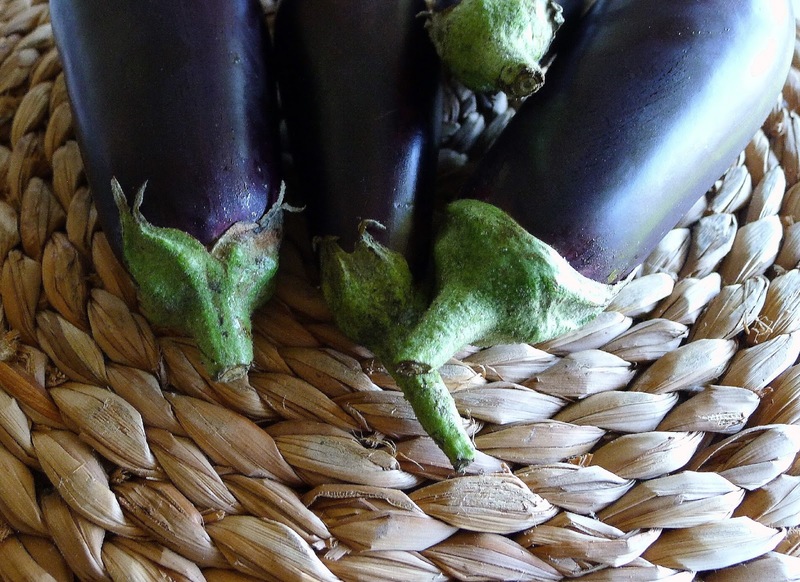 The microwved eggplant for baba ghanoush keeps its pale color remarkably well.